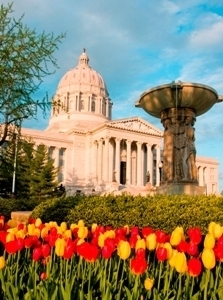 Jefferson City is the Capital City of Missouri, located on the banks of the Missouri River amidst rolling hills, majestic architecture and towering river bluffs in a small-town setting filled with historic charm. Jan 21.0 F° 30.5 F° 40.0 F° 1.9 "
Feb 25.0 F° 35.5 F° 46.0 F° 2.4 "
Mar 33.0 F° 44.5 F° 56.0 F° 3.0 "
Apr 44.0 F° 55.5 F° 67.0 F° 4.1 "
May 54.0 F° 64.5 F° 75.0 F° 5.2 "
Jun 64.0 F° 74.0 F° 84.0 F° 4.4 "
Jul 68.0 F° 78.0 F° 88.0 F° 4.3 "
Aug 66.0 F° 77.0 F° 88.0 F° 4.0 "
Sep 57.0 F° 68.5 F° 80.0 F° 4.2 "
Oct 45.0 F° 57.0 F° 69.0 F° 3.3 "
Nov 35.0 F° 45.5 F° 56.0 F° 3.6 "
Dec 24.0 F° 33.5 F° 43.0 F° 2.7 "
Spring temperatures are cool with averages in the mid 50's and highs in the mid 60's. Nights are cold with lows in the low 40's. Summer temperatures are warm with averages in the mid 70's and highs in the mid 80's. Nights are mild with lows in the mid 60's. Fall temperatures are cool with averages in the mid 50's and highs in the upper 60's. Nights are cold with lows in the mid 40's. Winter temperatures are cold with averages in the low 30's and highs in the low 40's. Nights are cold with lows in the low 20's.